Please see below our recommended book list. Just click on the links or images and you will be taken to the book entry on Amazon.co.uk. Add the book to your basket and then click the back button on your browser to select any further books that you require. Gerritsen and Oudolf describe their special choice of ideal plants – perennials, bulbs, grasses, ferns and small shrubs. The book provides complete growing information for each plant and advice on how to use them to best effect. Rather than striving to create big and bold masses of colourful blooms that are vigorously pruned back as soon as they have finished flowering, the Gerritsen and Oudolf choose plants chiefly for their form – leaves, flower heads and stems included – which retain their natural beauty through all the seasons. The structure of the book is based around the way that plants behave – their relative growing strengths and reliability – factors that always inform the authors’ designs. It provides an update of cultivars developed since 1999 however, and there are a number of suggested plant combinations that do not appear in the previous books which will be helpful to those enthusiasts developing a naturalistic style of planting in their own gardens. The text is also peppered with little gems of information that increase understanding of individual plant life cycles. To keen supporters of Piet Oudolf’s and Henk Gerritson’s work these features alone will justify getting the book. This volume looks at the landscape of 28 cultures, ranging from ancient Mesopotamia to the present day, and shows how the environment is conditioned by the philosophy and religion of each civilization. A selection from Geoffrey Jellicoe’s “The Atlanta Historical Garden” is included. This reference work is for anyone wanting to improve their garden. Design solutions are presented along with practical information enabling you to create a garden that looks and works as you want it to. The book is split into six sections on essential gardens, exterior design, living space, planting design, a directory and foundation techniques. An acclaimed landscape architect explains how nonprofessional gardeners can create dramatic landscape effects by using such water elements as fountains, pools, water falls, and dry streams, with tips on plantings, construction diagrams, and a glossary of favorite plants. This work provides information on how to achieve successful colour mixes in the garden. The split page format enables you to mix and match plants to create colour combinations, while notes provide planning information, including the growing requirements and characteristics of each plant. This third volume of “Landscape Construction” covers the design and construction of simple earth and water retaining structures as far as the normal scope of landscape work is concerned. Major civil engineering work such as highway embankments and reservoirs are excluded. Chapters one to four cover the simpler forms of earth retention likely to be part of a landscape contract, divided into: methods of construction that rely on the soil as part of the structure; various types of gravity retaining walls; and those which are constructed independently of the soil. Chapters five to nine deal with all types of water retaining construction, from “natural” lakes to small ornamental pools, and the construction of natural and ornamental watercourses are also covered. Basic building construction is an essential part of the landscape designers training and these three volumes aim to fulfil the need for straightforward and clearly demonstrated information on all types of hard landscape. On the educational side, these volumes should be useful not only to students of landscape design, and landscape management but also students of other associated disciplines such as architecture and surveying. Its use as a mid-career text book for those involved in mid-career courses will be welcome. For those in practice the annotated text will provide a reference for most of the commonly found landscape construction problems. the layout of related text, photographs and drawings make the information readily available as part of the professional’s personal bench library and also form a basis for preparing landscape construction projects in the college or university landscape course. Volume four of “Landscape Construction” covers the construction and placing of steps, ramps and small structures in the landscape. The small structures described are mainly of masonry or timber and include bridges, walkways, screens, shelters and pergolas; some will require concrete foundations, masonry piers and a timber superstructure. Some reference will be made to simple shelters and jetties. Landscape design must be based upon a fundamental knowledge of static structures and why they stand up to stresses and strains of weather and subsidence. These principles form the basis of the structures discussed in the book, but dynamic structures such as large scale working windmills are not discussed. Chapters one to four cover the materials and details used in small structures and their preservation. Chapters five to seven discuss the principles of design and construction, while chapters eight and nine cover the detailed construction of small bridges and boardwalks. Finally chapter ten deals with the effect of shading and lighting on the landscape and various techniques of creating light and shade. This is a study of Piet Oudolf’s “New Wave” planting theory and practice. Inspired by nature, his schemes demonstrate how form, texture, light and movement are as important as colour. The manual shows the essential building blocks of this style in special planting palettes, then explains how to combine them in schemes that will bring vibrancy to the garden throughout the year. The new edition of this guide for landscape practitioners reflects changes in legislation and developments in practice management. New to this edition is coverage on Common and Statute law, the CDM Regulations 1994, and the latest JCLI, ICE, and JCT standard forms. In addition, there’s a chapter on dispute resolution and sections on continuing professional development and professional indemnity insurance. 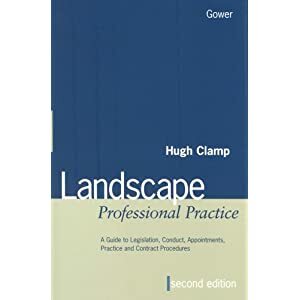 The book also offers advice enabling landscape practitioners to meet the legal, ethical and practical demands of their work. It gives detailed cover of all the requirements of the syllabus of the Landscape Institute Part IV Professional Practical Examination. This work offers a comprehensive source of detailed landscape and external works costs. It covers all the items to be found in hard and soft landscape contracts, and is therefore is aimed at quantity surveyors, landscape architects, and contractors. This edition has been organized in accordance with the Common Arrangement and SMM7. Every rate has been reworked and recalculated by Davis Langdon & Everest, in conjunction with Sam Hassall, one of the UK’s leading landscape surveying and cost management experts. A full index and list of manufacturers and suppliers gives easy reference to all items. Aimed at all photographers with an interest in gardens, from amateurs who need to learn techniques to professionals wanting to hone their skills, this book is illustrated with the author’s own work. He leads the reader through the variety of approaches to garden photography, analyzing vistas, close-ups and abstracts, and offering advice on coping with light and weather to produce the best results, whatever the conditions. There are also insights into the practicalities of making a living from photography. Clive Nichols’s photographs of English gardens have appeared in leading magazines, and in 1992 exhibitions of his work were held in at the Ilford Gallery in London, and at the Chelsea Flower Show. This guide is about the practical issues of being successful in the landscape design business. It provides a framework of the issues that underlie the work of landscape architects in business and in law. Collected into one volume are relevant but diverse legal, business and practical contract management themes of the Professional Practice examination. Information is presented in easy to follow line diagrams and flow charts. It should be of interest to students preparing for the professional practice examinations and as a reminder for professionals. It is relevant in the UK and in all countries in the Commonwealth that practice under UK rules. Covering the principles of construction of macadam and concrete roadways, this volume examines techniques with and use of all types of small paving units and granular materials, and the drainage of paved areas. Current British Standard references are included throughout. This text was created to teach students in introductory landscape design basic drawing and drafting skills. Though computer graphic software and techniques are described, the bulk of the text teaches the materials and techniques used for drafting by hand. This handbook covers walls (free-standing, screen and retaining), fences, gates, barriers and bollards. Each section begins with technical guidance notes on design and construction and then provides a list of points against which specifications can be checked. This is followed by a set of drawn-to-scale detail sheets, which can be traced for direct incorporation into a set of contract drawings. This book is designed to be of interest to landscape architects and contractors, architects, surveyors and students of landscape and architecture. Written for courses in landscape design, this text is aimed at students who are beginning their design careers, as well as those currently practicing residential design. It provides the quality fundamentals of residential site design – exploring functional and artistic considerations. First published in 1992, this text is widely used on landscape architecture courses around the world. It examines the horticultural, ecological and aesthetic characteristics of plants, and discusses the structural and decorative roles of planting, spatial composition, species selection, planting plans and spacing, and the vital role of management. With its fresh look at aesthetic principles and its analysis of the design process, it reveals how a systematic approach can allow the greatest freedom for the creative imagination. Use this toolbox of techniques to bridge the distance between concept and form. New approaches, featuring the use of naturalism as a form determinant, ease the transition from general concepts to specific physical shapes and detailed organization of spaces. This text contains the essence of Thomas Church’s design philosophy, as well as practical advice. It is illustrated by site plans and photographs of some of the 2000 gardens that Church designed during his career. Called “the last great traditional designer and the first great modern designer”, Church was one of the central figures in the development of the modern Californian garden. For the first time, West Coast designers based their work not on imitation of East Coast traditions, but on climatic, landscape and lifestyle characteristics unique to California and the West. Church viewed the garden as a logical extension of the house, with one extending naturally into the other. This volume covers structures (pergolas, arches, arbours, decks, shelters, information signs) and furniture (bollards, seats, litter bins, tables). Each section begins with technical guidance notes on design and construction. A list of points against which specifications can be checked and a set of drawn-to-scale detail sheets are included. Covers surfaces including foundations, kerbs and paving – vehicular and pedestrian, steps and ramps, margins and edges, kerbs and wheelstops and drainage channels. The book is a reference for landscape designers. Whether you feel you have little talent and you doubt you could ever learn, or you enjoy drawing, but have not been able to get much beyond a childlike level, this book aims to give you the skill you have always wanted. If you are already drawing as a professional artist or artist-in-training, it aims to give you greater confidence in your ability and deepen your artistic perception. This 20th-anniversary edition of “Drawing on the Right Side of the Brain” has been revised, with more than 50 per cent new material, including: recent developments in brain research that relate to drawing; new insights on the use of drawing techniques in the corporate world; and education instruction on self-expression through drawing; and ways to step beyond black-and-white drawing into colour; and detailed advice on applying the five basic skills of drawing to solve problems. Contains examples of several of the principal design lectures work as well as guest lectures. Good inspiration and pictures. Announcing the new revised edition of the classic industry reference! “Landscape Graphics” is the architect’s ultimate guide to all the basic graphics techniques used in landscape design and landscape architecture. Progressing from the basics into more sophisticated techniques, this guide offers clear instruction on graphic language and the design process, the basics of drafting, lettering, freehand drawing and conceptual diagramming, perspective drawing, section elevations and more. It also features carefully sequenced exercises, a complete file of graphic symbols for sections and perspectives, and a handy appendix of conversions and equivalents. Driveways, Paths and Patios: A Complete Guide…. Driveways, paths and patios are an essential part of most properties and this comprehensive book provides a detailed explanation of exactly how they are designed, planned and constructed. The features of this book are: discusses the design of driveways, paths and patios with reference to their planned use, style, size, gradients and special features such as steps, ramps and terraces; considers the range of materials available including block paving, flags, slabs, setts, cubes, cobbles, loose aggregates, plain and patterned concrete and tarmac; analyses how to estimate costs and making the choice between the DIY approach and using a professional contractor; examines the critical issue of drainage; lays bare the mathematics associated with accurate setting-out and levelling; describes the range of tools and equipment needed; details the correct constructions of kerbs and edging and laying methods for flags, block paving; and much more. Drawing and Designing with Confidence . This is an illustrated, step-by-step procedural guide designed to help the reader improve graphic technique. With a teaching style that stresses speed and relaxation, the author covers all aspects of design, graphic composition, media, types of drawings and perspective techniques.